Discussion in 'General Discussion' started by crazikyle, Jan 26, 2016. I've just read the devlog of the last hotfix and saw, that they mentioned the "new imgui" which is being used for the track builder or scripted AI. It doesn't look as fancy as the current one, but it feels more responsive and probably it is faster overall, which might be the reason the devs replaced the performance graph. Maybe they will translate all that debug stuff and "advanced users experience" imgui. What do you think they gonna convert from the existing user interface to the new one? I find it more pretty, crisp clear lines and text that is sharp as well as easy to ready without being unnecessarily big, so you can actually fit some information on screen. Meh, it looks pretty old-fashioned - which is fine, when we get a massive performance boost in return. But old fashioned is hottest hot thing of the pastyear, retro is in, we are at bleeding edge of fashion, right, right? Awwww, I knew it that I'm just old and unfashionable, who still wishes excel would take a turn and return to old 3D buttons. They did mention before that the map is still WIP, so parts of it are currently unfinished. Any plans to improve the "Featured Resources" tab so it gets updated like every week or so? Currently tab is updated when synsol have time. These usually go below everything else in the material definition. Could be used to get pretty sweet results. as of now it isn't exactly 100% working from what I was able to test. 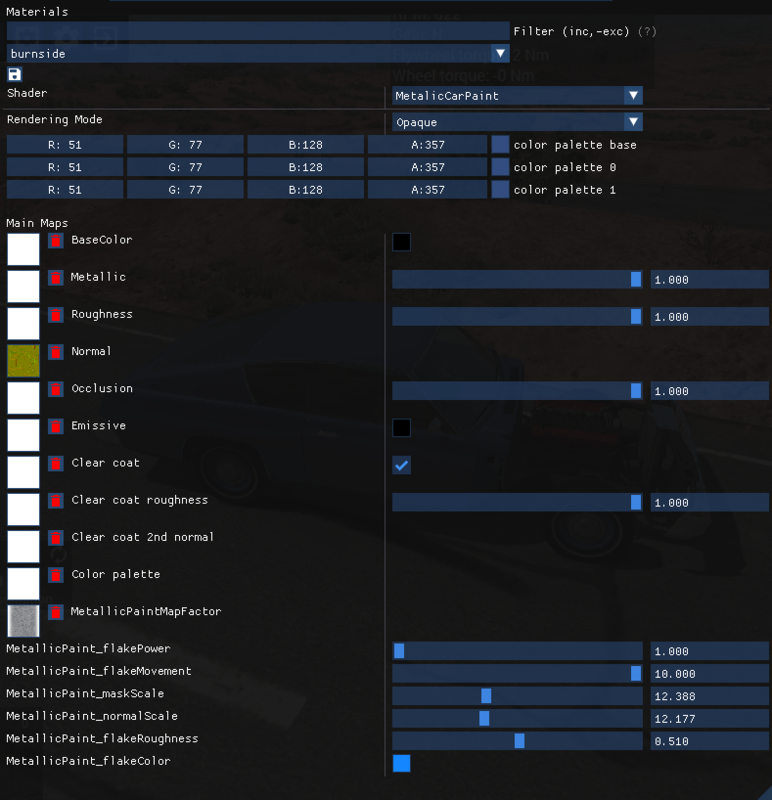 How the metallic paint effect is applied on the whole material map, which means unless you use MetallicPaintMapFactor (glitter map let's call it) specifically made for a certain vehicle it will also cover trim pieces, frame and everything else that material uses. It can also produce some graphical glitches in certain combinations of values. I'm not sure if this was already brought up but there are dae files for V12 components in the ETK 800 and K-Series' folders (the K-Series also has a V12 exhaust jbeamed). Could be a potential ETK Kc12 and ETK 8512. There is no dae or jbeam for the engine itself though. A V12 would be nice, although there are no V12 sounds in the game as far as I'm aware. Interesting. I always wonder if the devs purposely leaves those there as a kind of teaser. I think it's cool that V12s are coming for the ETKs. In a K-series I can sorta understand it, but a V12 in a relatively small modern wagon is totally out of place, V8 would fit the bill much better. Also for people wondering about the sounds, with some fine tuning and creativity you can make thr V10 sounds sound like a V12.